How to Become a Surgical Assistant? Surgical assistants advise the patients and explain to them everything concerning the operation that is to be performed. They also determine the surgical equipment that is to be used during the surgery and they position the patient suitable for the surgery. During the operation, they have more significant responsibilities. Surgical assistants follow the instructions for the surgeon and usually insert drainage tubes, dissect arteries, assist with the closure etc. It is very important that the surgical assistant is calm and fully concentrated during the surgery and it will certainly be very beneficial for the operation and the patient if he/she can anticipate the surgeon’s needs and requests. Surgical assistants work in operating rooms, which are a cool and wee-lighted working environment. But, they should be able to stand the whole time while the surgery is being performed and should handle stressful and unpleasant situations well. Surgical assistants usually work 40 hours a week, but because of the unpredictable character of this profession, they should often work overtime, night shifts or on weekends and holidays. Completing an accredited surgical assistant program makes one eligible for national certification. The National Surgical Assistant Association (NSAA) is the professional organization of surgical assistants. It offers the Certified Surgical Assistant (CSA) examination. This certification should be renewed every two years, by completing 50 continuing education classes and paying the necessary fees. There are benefits for NSAA members concerning the fees and the deadline for paying them and submitting the documentation needed for recertification. According to the National Surgical Assistant Association, the average starting surgical assistant salary is approximately $55 000 per year. The average annual income of surgical assistants is around $75 000, whereas the best paid surgical assistants can earn more than $120 000. This field is expected to grow significantly, so there will be more employment opportunities for surgical assistants. Hospitals are the primary employers of surgical assistants and this is not expected to change in near future. However, there are a certain number of surgical assistants that are self-employed. The career advancement for surgical assistants usually means getting a job in an environment different than a hospital, such as insurance companies, sterile supply services, surgical instruments companies etc. However, an experienced and educated surgical assistant could also become a supervisor of other surgical assistants. The surgical assistant is a prosperous and fulfilling job. Because of its significance and the responsibilities it brings, it requires thorough training, but this certainly is a worthy investment. The field of surgical technology is one of the very few that can offer a very satisfying income, as well as a fulfilling job. Also, surgical technologists enjoy significant career security, as the demand for such professionals is rapidly increasing. It is estimated that there are five surgical technologist positions for each surgeon position, but also, since a significant growth in this field is expected, the number of job opportunities for surgical techs is to be increased. According to US government data, the bottom 10% of salaried surgical technicians earn less than $30,780 per year; the majority of technicians earn $43,350 (median) whilst the top 10% earning more than $62,170 per year. Professionals in this industry will find more job opportunities and better job security in this areas as well as a strong earning potential. The pay scale for surgical technicians in Terre Haute IN is the highest among metropolitan areas with high employment levels, with an annual average salary of $47,480. In Florence, SC surgical techs earn an average of $39,480 annually. In Bowling Green, KY surgical techs can expect to earn around $37,150 and in Hattiesburg, MS the average is $37,320. 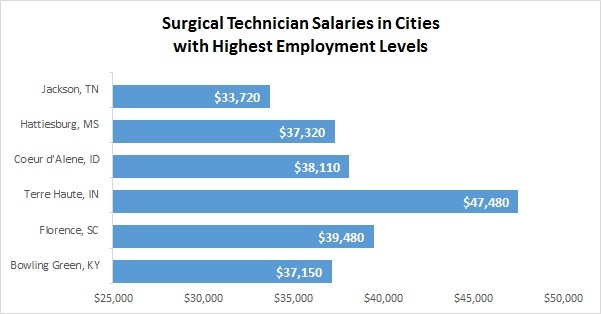 For surgical technicians, salaries can vary a great deal from one city to the other. The Oakland, CA area is the highest paying metropolitan area in the country for surgical technicians. A surgical technologist average salary is $68,350 per year or $32.86 per hour. The next best place to live and work as a surgical tech is the San Francisco Bay region, with surrounding areas claiming the remaining slots in the top five highest paying areas in the country. San Francisco is the 2nd highest paying area and surgical techs earn $68,300 annually. In Sacramento, surgical techs earn $65,570 on average. 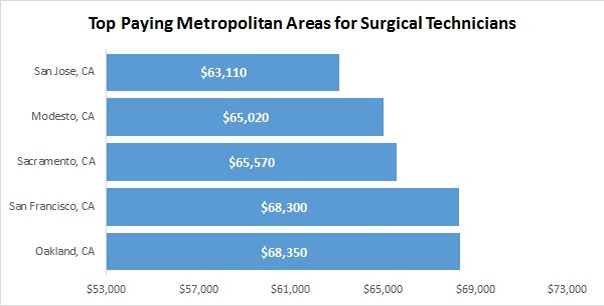 The Modest area is the 4th highest paying metropolitan area with surgical techs earning $65,020 annually. Finally, San Jose area is the fifth highest, where surgical techs earn $63,110 as an annual average or $30.34 per hour. 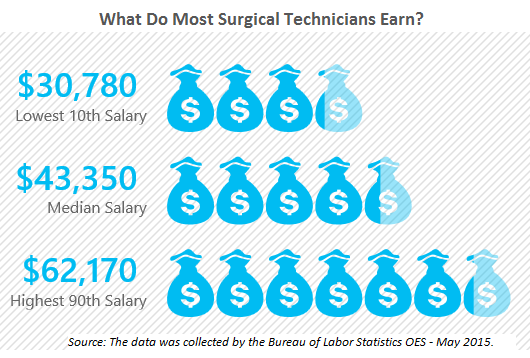 Surgical Technician salaries vary widely based on several factors. For example, a surgical tech can make more than another professional in the same industry simply because he or she lives in a high paying geographic location. While most of us would love to move across the country to make more money, we don’t always want to leave our friends and home behind. The good news is you can take more control in your career by pursuing an industry within the surgical tech position that is high paying. Surgical techs working in Home Health Care Services are the highest paid surgical techs nationwide and can earn an average of $62,420 annually. Those working in Educational Institutions are also well-paid with an annual average salary of $53,130. Health Practitioner’s Offices is another top-paying industry in the profession and surgical techs in this area earn as much as $52,460 annually on average. Speciality Hospitals offer the 5th highest paying positions for surgical techs with an average annual income of $47,840 or $23 per hour. Although there are surgical tech programs that can be completed in a year or less and provides the individual with a diploma or a certificate, if aiming for the highest earning potential, then education should be prioritized aiming to earn a minimum the Associate’s degree since it is the preferred choice by most employers. This educational process takes approximately two years and it will turn one into a qualified individual with opportunities for a higher income. Also, obtaining national certification will significantly improve one’s overall success in employment and higher earning capacity. Certified surgical technologists command earnings of around $50,000 per year. Experience, of course, is another crucial factor in determining the salary of a surgical technologist. As one gain experience, their value as a professional is also increasing. Surgical technologists with more than two decades of working experience can earn above $60,000 per year. Another important factor in determining a surgical tech salary is their skills or area of specialization (plastic surgery, open heart, robotics, orthopedics, OB/GYN, Optometry etc.). Salaried technicians who specialize in orthopedics earn an average of $43,000, followed by Surgery ($41,000), General Surgery ($40,000), Labor & Delivery ($39,000) and Medicine ($40,000). The profession of a surgical technologist does not require long years of education, which makes it more suitable and achievable for the ones interested in this area of work. It is an appreciated job with a very satisfying income, so investing in such career is an intelligent decision.